Taste and taste again. Does it need more heat? Add in a bit more Sriracha. More sweet? Add in extra molasses. I really like the taste of molass in peanut sauce as I think it gives the sauce added richness and depth to the flavour. When you achieve something delicious, turn off the heat and pour over some shredded green and purple cabbage, sliced green onions and diced carrots. I mixed the whole shebang together and let it marinate in the fridge for a little bit while the rest of my dinner cooked. And while the salad was delicious for dinner, it was even better the next day for lunch. 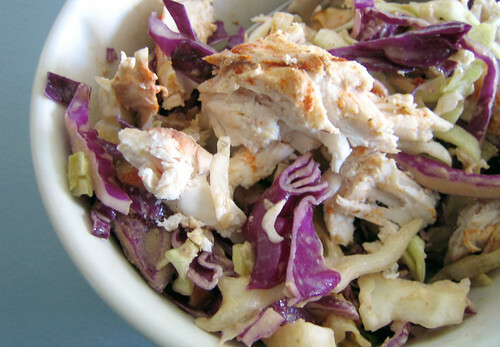 I shredded up some of our leftover chicken breast and mixed it up with the cabbage salad and enjoyed every peanutty bite. Peanut sauces are amazing. I just recently discovered their versatility and have been adding them to my Asian dishes like basmati rice and soba noodles but I have yet to venture into the realm of salads. Judging from this recipe, it has all the makings of a great peanut sauce and some new surprises too. For instance, what is sirracha? Bought a purple cabbage and a green one and made both this and that awesome soup. Very easy to make and out-of-this-world good! Thanks for the recipes. That peanut sauce would be awesome with noodles and shrimp too. 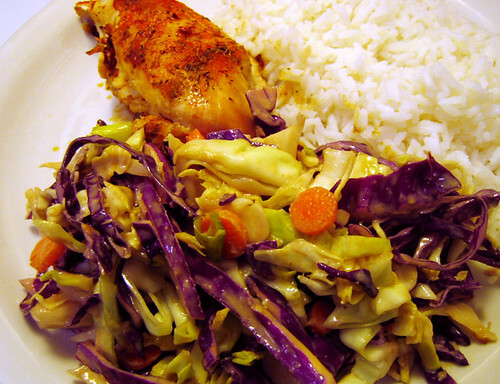 russ, i’m so excited that you made 2 cabbage recipes of mine! glad you enjoyed them and last night i made chicken skewers and served them with the leftover peanut sauce! yum. I just made this salad…I love the flavors….have some leftover chicken from “Antipasto Salad with Grilled Chicken” (Food & Wine, July 1996. There is a veggie stand on my way home, that uses the honor system…there were cabbages and I immediately thought of your recipe!